This ongoing public outreach project has received support from the NSF Biological Infrastructure program award "Shape Analysis for Phenomics with 3D Imaging Data (SAPID)" (DBI-1147260), in collaboration with Dr. Kathryn Dickson at California State University Fullerton and Cabrillo Marine Aquarium (CMA) in San Pedro, California. 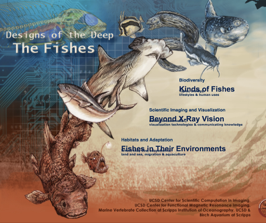 Its goal is to develop an interactive exhibit that promotes CMA visitors to appreciate the great morphological diversity of fishes that live in our local coastal waters by providing engaging visual resources that showcase unique views into the fishes’ inner anatomy. Along with supporting exhibit materials, visitors will be encouraged to compare and contrast in real-time what they are seeing in the live and/or preserved fish exhibits with what they are seeing in the interactive 3D visual models of these fishes. By combining live animal displays with museum styled interpretive exhibits in display space in this manner, CMA's guests are able to experience the complexity and wonders of plant and animal marine life in a whole new way. 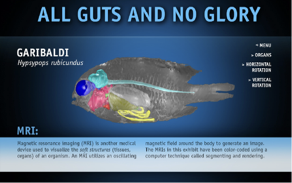 This online educational outreach project was initiated with funding for the Digital Fish Library (DFL) project from an NSF Biological Infrastructure program award (DBI-0446389). Additional funding was provided by COSEE-California and Earthguide at Scripps Institution of Oceanography. The Designs of the Deep website and its educational content was designed and built by the Earthguide online educational media group at the Geosciences Research Division at Scripps Institution of Oceanography. Earthguide has worked with UCSD undergraduates in developing educational websites for schools and the public. Most of the animations contained in this website were produced by an enthusiastic and creative team of UCSD students.